I realized that, for whatever reason, in my artistic pursuits I have steered myself away from painting. When I discovered Photoshop, I was very happy because it seemed like the "safer" way to paint. 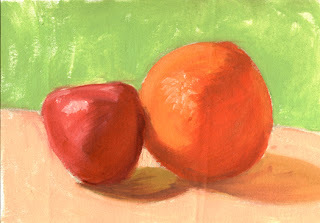 The time has come where I can no longer avoid the issue, so I decided to take some painting classes to get me started. Theres a great little not-for-profit art school locally called Crealde where I signed myself up for an Intro to Oil Paint class. Unfortunately each class only has like 5 or 6 sessions, but thats enough to get the ball rolling. Here are the results of my oil painting class. I call these sketches because they aren't even close to being done. This first one was about an hour's worth of work. I think its obvious I have a lot to learn here. 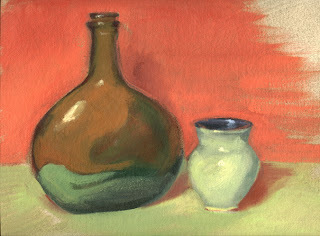 Each session became less demonstration and more time to paint. This one took about 2 hours. This last one took almost 4 hours. 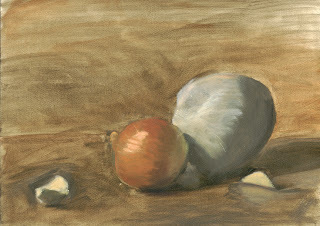 Painting onions is deceptively hard. For years I would hear how great it is to paint in oils, but I must admit I don't feel like its a medium I would pursue much further. On one hand, I like the mixing of colors because theres just something about colors in oil. There's a certain...naturalness or life to the colors that you just can't capture with a camera. Well maybe thats not true for these, but if you ever see really good paintings in person, they just have something that you can't reprint in a book. Plus they dry really slowly so mixing large amounts of color isn't much of a problem. On the other hand, they just dry sooo slowly! I can't stand the drying times. If you are working on something and you want to let it dry before you go on, you have to wait about a week! Plus there is a lot more of a process (and more chemicals) that goes along with oils. Its just a little too high maintenance for me. Which says something about me: I'm impatient and lazy. Even though I didn't enjoy the oils as much as I thought, I'm still willing to give it more time. Maybe I'll have an epiphany or something. In the meantime I have signed up for a portrait painting class and this one is mostly acrylic, so I'll see how that works out. I think you'll dig the acrylics, however you'll find opposite problems. These are great for not having painted in years. I'm so excited to see you doing this.